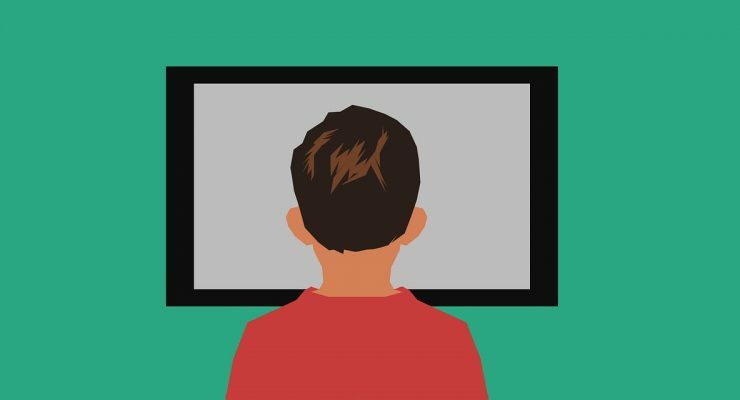 Parental controls enable guardians to control what their kids can watch. Even if you’re not concerned about your kids intentionally seeking out inappropriate content, it can often come to them by accident. Apple TV’s parental controls give parents broad control over the content that can be displayed on the Apple TV, giving parents power over what kids can do with the device. Adult viewers can always override the settings with a four-digit PIN, which is also required to edit any enabled parental controls. Apple uses the word “Restrictions” rather than the phrase “Parental Controls” in the Apple TV interface and support documentation. For consistency, we will adopt that usage in the steps below as well. Parental controls are the same as Restrictions, just by a different name. Depending on the variety of Apple TV you have, follow the correct instructions below to set and use Restrictions on your device. If you’re having trouble identifying which Apple TV you own, you can follow Apple’s pictorial guide to identifying your Apple TV. Before you can use Restrictions, you’ll need to enable the service and set a PIN for access to parental controls. 1. 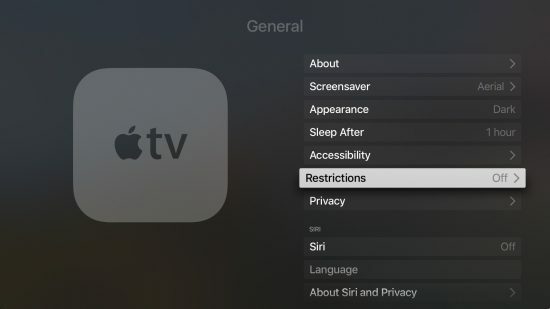 From the Apple TV’s home screen, open the Settings channel and navigate to General > Restrictions from the Apple TV home screen. 2. Select Restrictions again to turn the service on. 3. Create and confirm a four-digit PIN. This PIN will be used to when editing parental controls, so try to make it difficult to guess but easy to enter. 4. Select OK to turn on Restrictions. Once Restrictions are enabled, you can set specific permissions. 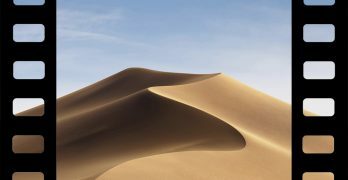 Navigate to Settings > General > Restrictions from the Apple TV home screen. In the Restrictions menu, the previously disabled and non-selectable items below the Restrictions toggle will now be accessible. To set restrictions for various services, scroll down and select the correct service. Choose from the available restrictions for the selected app, service, or product. If prompted, enter the PIN number you set when enabling Restrictions. Depending on the application, content, or service you’re applying a restriction for, different options will be available. The options for restrictions vary from item to item in the Restrictions menu. 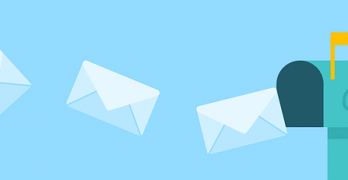 In general, you have the option to either permit the service without restriction, require a the Restrictions PIN, or set age-based controls for restricting content. Show/Yes/Allow: Use this option to enable the service without restriction. This is the same as disabling Restrictions for that service. The service can be accessed without entering the Restrictions PIN. Restrict/Ask: Use this option to require the Restrictions PIN before the service or product can be accessed. Without the correct PIN, the restricted service or product cannot be accessed. Block/No: Blocks or disables the feature completely and removes the content from searches and playback. Hide: Use this option to hide the service. 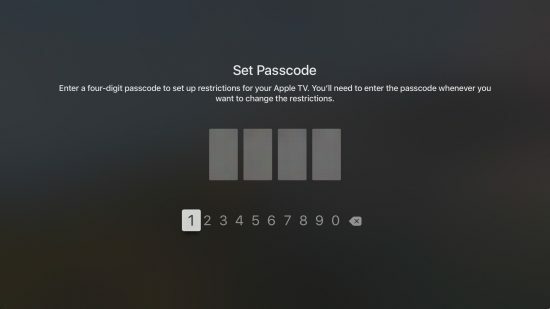 What Restrictions Can Be Set on Apple TV? 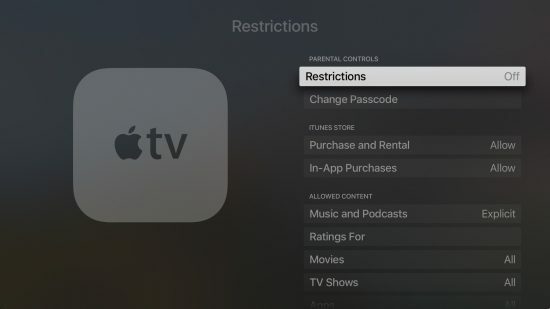 Here are some examples of the most commonly-requested types of restrictions and parental controls that you can set on your Apple TV. Older Apple TVs may not have access to features like the Siri remote or Apple TV apps. Purchases and rentals from the iTunes Store: Allow, Restrict (require PIN) or Block. Free content will not be affected by this selection. Music, Podcasts, Audio: Explicit allows the purchase and playback of content with an Explicit label. Clean only permits content without an explicit language label in iTunes. Any item tagged with a Parental Advisory Warning from the RIAA will be marked with the Explicit label in iTunes. Content uploaders can also voluntarily mark their content with the Explicit tag, indicating adult audio content. TV Shows, Movies: Permit content based on MPAA ratings and TV content ratings. Available ratings are supplied based on your Apple TV’s locale settings. Watching TV shows and movies can also be completely disabled by setting Don’t Allow Movies or Don’t Allow TV Shows as appropriate. Apps: Force a specific locale and block Apple TV apps based on age ratings (4+, 9+, 12+ and 17+). Apps can also be disabled all-together with Don’t Allow Apps selected. Siri Explicit Language: Choose Hide to prevent Siri from “hearing” any mature language. Choose Show to disable language filtering. Hardware applications and services like AirPlay, Conference Room Displays, Location Services, and several other options can be set to Allow, which permits the service to be used, or Restrict, which requires the four-digit Restrictions PIN to use the service. Can the New Apple TV App Compete With New Streaming Services?